Kampot Pepper was first mentioned by Chinese scientists in the 12th century and was introduced to France by the colonialists in the 18th century. 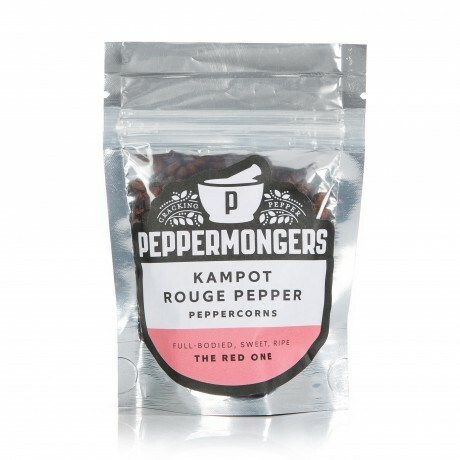 This noble red, black and white pepper from Kampot has a fruity-spicy taste and is an absolute rarity. Our pepper comes from a small family farm in the south of Cambodia. From planting to harvesting and packing everything is done by hand in a traditional manner, every single pepper corn is handpicked. The pepper has been issued with a geographical certification (GI) by the Kingdom of Cambodia. Moments after harvesting, sorting and sterilising the pepper it is packed in vacuum bags. This way we guarantee the ultimate freshness of the product and we are probably the only company doing it this way. The pepper from Kampot is known for a high Flavinoide contens which has anti-oxydising properties. Piperin is good for your metabolism and promotes digestion.